Have had to stop knitting. 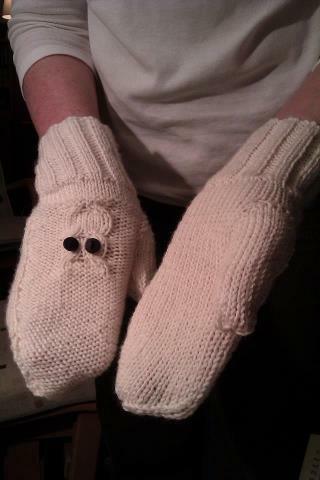 I managed to finish the project I was on, which is a pair of mittens with owls on the back for YD. They look really nice, and are knitted in merino, silk and cashmere, so they’re very soft and should be very warm. It was fabulous to knit with. However, it’s a big downer to have had to stop. I was aware that I might not be able to do any more projects, but was hoping with better pain control I could carry on. But no. And the pain, despite no more knitting, is still dreadful. Doctor’s on Wednesday. I think it’s probably the pain that’s making me feel so low, too. I’m trying not to be a miserable old baggage, but am afraid that is exactly what I am. So I’m trying to regain at least some sort of control over my life/emotions. I’ve put away neatly all the knitting stuff. I’ve nearly finished Christmas shopping – only two more presents to go. I’ve ordered new egg-box (ripple) mattress toppers for us both, and a fancy pillow for me, as I’m struggling to get comfortable at night. It does give me a feeling of control, even if that’s not completely true. And of course I just need to wait for my operation. It should be beginning of March 2013 at the latest, but then there’s a 3 – 4 month recuperation – according to the consultant, and they do tend to minimise such things, so it could even be longer. Plenty of things to do in the meantime. Crosswords, reading, the extremely easy Pilates class I’ve started going to. And of course plenty of sleeping. This week I have three medical appointments. One is for Vic, but I need to drive him as he will have a numb foot when they’ve finished. One for the doctor, for me, and one for the foot people for me on Thursday. And I’m just not going to book anything else in at all because I’m knackered. I’m not actually in tears all the time, but pretty close to it some of the time. What fun for hubby to live with, but he’s very good and kind and patient. Thank goodness. What would I do without him? 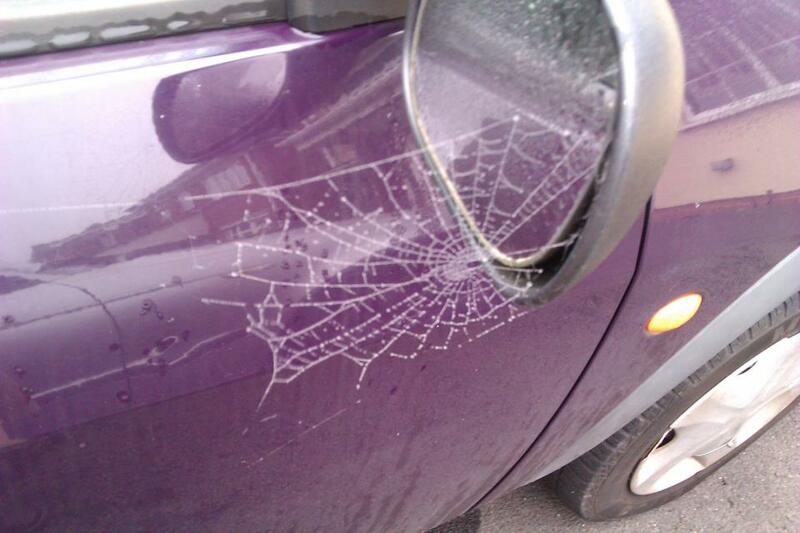 And to finish, here’s a photo of a spider’s web on my car. I think the spider lives in my wing mirror, and has the patience of Job, because the web gets wrecked every time I drive. Pain control – well, the Tramadol + Paracetamol work to a degree, and certainly better than the Cocodamol. But I’m still in some pain, and feeling very worn down by it. Seeing the doctor next week, so will talk to her about it then. Went to a craft show at the NEC last week. Disaster. I thought if I went on my own, I could potter about and sit down whenever I needed to, and just take it gently. Within ten minutes I was shaking, dry-mouthed, and just wanted to sit down and cry. Fortunately I didn’t, but it was just so crowded I was feeling panicky. Had a cup of tea, and calmed down a bit, but didn’t find anything I wanted to buy, and after 50 minutes of hell, I found my way out (with the help of two police officers), and phoned hubby to ask him to fetch me home. I was still shaking half an hour after I got home. What a waste of £9 for the ticket. The trip to Birmingham to see the “get a job” people didn’t materialise. They phoned me up two hours before I was supposed to be there, and talked me through it on the phone. Eventually they suggested I could maybe work from home. Hmm. I’m just asleep all the time! and weepy and pathetic when I’m awake. Yesterday morning had my feet done – love it. This morning went to see my friend I used to work with – didn’t stay long, and had a much needed rest this afternoon. Have tried to do some knitting tonight, but had to stop, take some painkillers, and come and play on the computer. It’s settled a bit now, so may have another go. I’m knitting some mittens, with an owl pattern on the back, for YD. Well, I think that’s probably it for now. The knitting group is going well, and things are afoot. One of the women has a foster dog, who is being socialised ready to be a “helper” dog for people with extra needs. She’s called Paige, and will be allowed into the coffee shop on Thursday because of her special status, and I can’t wait to meet her! she looks beautiful. I’ve been struggling with the pain in my hand, big time. Saw the consultant last Friday, and he’s put me on his list for surgery. It will be a trapeziectomy, with something fancy schmancy with a tendon to prevent the thumb from shortening. However, the Cocodamol were making no difference, even the 30/500 dose, so I found some Tramadol. I keep a small stock for any back “episodes”, but felt that my hand was so painful I really needed to try something more powerful. And they worked. I hardly had any, so eked them out until today when I saw the GP, and she was very helpful. She’s prescribed me more of them, and suggested I take two Tramadol first thing, and then for the next three doses, take one Tramadol and two Paracetamol. As the Paracetamol were making no difference at all, I was sceptical, but am very pleasantly surprised that it works a treat. And what about Obama! thank goodness for that. He’s such a good man, and deserved to win. Happy. Knitting – can do short bursts, but as I’m only doing small projects, that’s ok. Have just tried to knit one daughter some mittens, but the first one turned out absolutely massive, and is even too big for my husband. So I’ve found another pattern, and will get some more, different, yarn and try again. Much colder here now. But it is November. Christmas shopping going well, more than half done. A few bits and bobs to get, and I need some ideas, but am working on it. YD hasn’t been very well at all, for several weeks now. Consultant tomorrow, hope s/he suggests something constructive. Life is becoming busier and busier. I try really hard to keep things to a minimum, but sometimes you just have to do stuff. Friday I have to go into Birmingham for somebody to talk to me about what I need to do to get a job! for goodness’ sake. My friend from school is coming with me, as I don’t cope well with that sort of thing, and I need support. Hubby is at the hospital so he can’t come. Hubby loves his Kindle which I bought him for his birthday – I’m so pleased. Mine has done a software upgrade today – the first one in a year! but will see what differences there are. Not sending Christmas cards this year – at 50p second class for each card, it would cost £45 at least just in postage. We’re going to telephone the people we don’t see, which is probably a better idea anyway. Things are afoot with the Stitch group – premises have been found, the shop may be opening in the not too distant future – it’s so exciting. And walking distance from where I live too! Yesterday was hubby’s birthday. 67 years old. Quite a big number. We had a lovely day together, pottering about. I gave him a Kindle, which he is very pleased with, and is now using it. Next problem – what to get him for Christmas! but I have a few ideas. Went to the hospital today. Hubby took me, as it’s Warwick Hospital and not that close (but closer than Heartlands!) and we had to be there at 8.35 am. They have decided to operate on my hand thank heavens. They’ll remove the trapezium bone, do something fancy with a tendon to stop the thumb shortening, and inject both hands in the first and second finger knuckles, because those are swollen and painful too. It’ll be a general anaesthetic, day case, and it’s just a question of waiting now and getting some decent pain relief, as I’m struggling at the moment. Co-codamol don’t really help that much with the pain and make me feel very odd and woozy. Tramadol work really well for the pain but I have hardly any of those, so I have made an appointment to see the doctor next week to get some more. Last night I was woken up about 2 am by the sound of the smoke alarm cheeping to tell me the battery was gone. Now, even fully awake and as alert as I ever am, I’m not good up ladders. Certainly not in the middle of the night. So I eventually shut the bedroom door and hoped for the best. Didn’t work. So I spent the whole night trying to not hear it. When hubby got up, he took the battery out, so I thought Phew, now I can relax. Beep. Beep. Beep. I got up, stomped furiously about, took the batteries out of all the other smoke alarms, and could still hearing beeping. Turns out we have TWO smoke alarms at the top of the stairs. Grrrrr. Took that battery out, replaced the lot, and now we have a NEW PLAN for smoke alarms. The batteries are going to be changed every year, whatever, so I never have another night like that. So when we got back from the hospital, we both had a nice cuppa (me – tea, him – coffee), a piece of lovely chocolate cake I’d made for his birthday, and I took some painkillers and Went To Bed. I slept for five hours, but am still woozy. If I sleep better tonight (which I should! ), all will be well tomorrow. Am intending to have another go at a new (to me) knitting technique called Magic Loop. It means you can knit stuff in the round without having to use several double-pointed needles, which is difficult for me. I tried yesterday several times, and eventually managed to sort of make it work. I need to be fully rested, calm, and have daylight. So tomorrow it is.